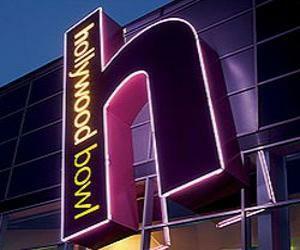 Hollywood Bowl0844 826 1455work Ten Pin BowlingWelcome to hollywood bowl the UK’s number one tenpin bowling experience. If you want to go tenpin bowling in the UK then look no further than your local hollywood bowl. Our aim is to give you and your party the perfect bowling experience whether you are looking for a kids party, an office event or to spend some time out with friends. Founded over 15 years ago and part of the Mitchells & Butlers portfolio of leisure venues, hollywood bowl has a great track record in providing top quality tenpin bowling. Our well trained and helpful staff work with state of the art facilities to ensure your visit is great fun and safe. Each of our 24 tenpin bowling centres has a minimum of 24 lanes, a licensed bar, a café and an up to date games arcade area. This combination of fun, facilities, staff and service makes hollywood bowl an important choice when it comes to choosing a leisure activity for a great time out. Welcome to hollywood bowl the UK’s number one tenpin bowling experience. From the M62, exit at Junction 26 and take the M606 to Bradford. Upon entering Bradford bear right onto Rooley Lane - A6177 and at the roundabout take the fifth exit onto the A6177 (signposted Ring Road West, Hospitals). Bear right then turn right onto Manchester Road - A641. At the traffic lights turn left onto the A647 then immediately right (signposted Keighley, Skipton, Leeds). Continue straight ahead at the traffic lights onto Croft Street and turn left onto Vicar Lane. There are plenty of parking spaces outside hollywood bowl which is on the right.